I was going to write this post anyway, as a short fluffy brag-piece (with some shameless promotion thrown in — after all, I’m “in the business” now). But then, just before beginning, I had the good fortune to read Iggy O’s latest post, Two Ways to Play & Virtual Worlds. Iggy, it would appear, has led a model life (pun most certainly intended!). When I built a kit then, the banality […] fell away. I was lost completely in a task, one requiring the type of focus that a Zen Master would recognize. Yet immersion in the task was only part of the fun for me. In junior high, I had to take a “shop class”, a.k.a. Industrial Arts. Fate would have it, I chose Drafting… and I’ve supported myself through most of my life since by doing just that. Most of it has been using a computer and AutoCAD, but drafting is still drafting, in the final analysis. It also turns out that, instead of machine parts or circuit diagrams, I fell into the branch of engineering which assists architects in making buildings habitable, and not mere pretty but empty shells. 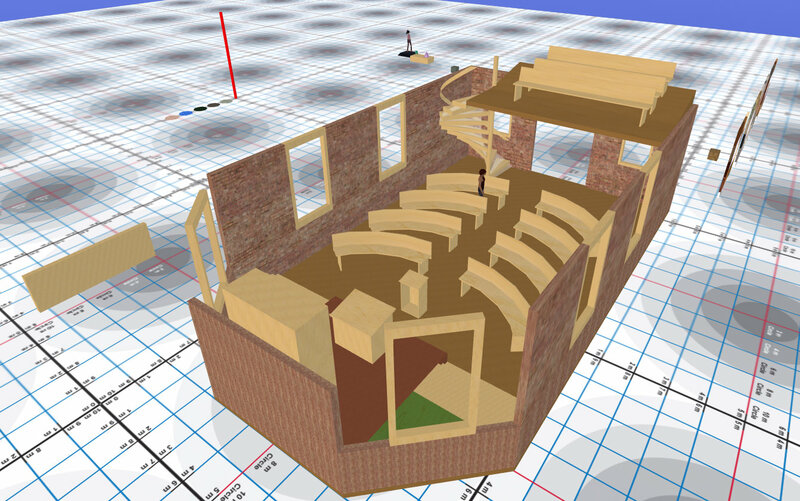 Decades later, I find myself in virtual worlds — first SL, then OSGrid and now InWorldz — and there at my disposal are tools to create things out of geometry, something I have some experience doing. There’s not much call in virtuality for the kind of systems I’ve spent my career designing to put in buildings (none at all, in fact), but there are the buildings themselves. Add to that: I found a partner (not just in business, either :) ) who also has a passion for building, and an excellent eye for decoration. 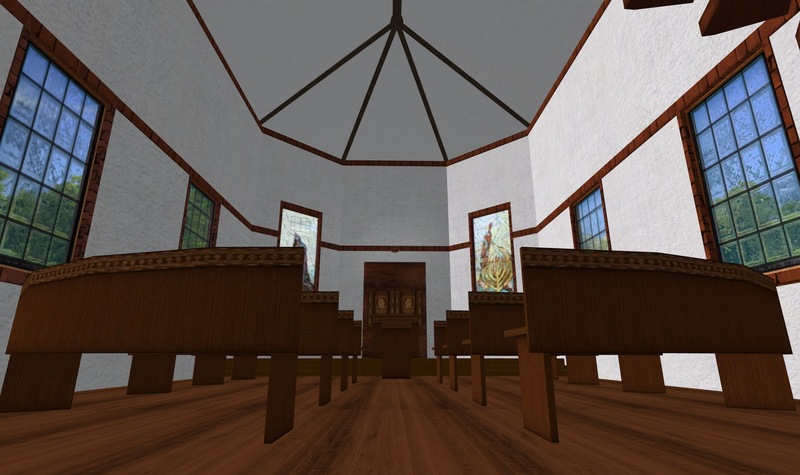 Our relationship began with and grew around collaborative builds, and when we expanded our virtual presence to InWorldz, we decided to see if any of our stuff would sell. Using InWorldz’ Classifieds listing (the only reliable search there, for now, but they’re free) I took a tour of other prefab sellers — to see what was out there, how we compared in quality, and to get an idea of price range. As you might expect in a virtual world so young, with SL outfits still just finding out about it, the competition was slim, the prices were all over the map, and the quality ranged from excellent to pure dreck. 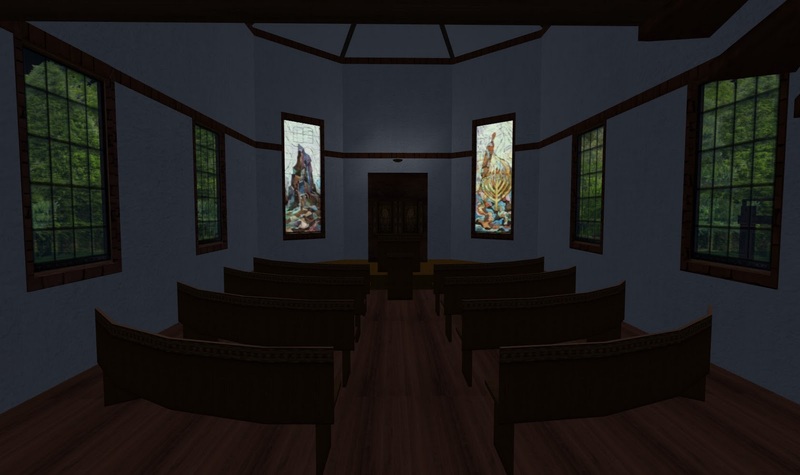 One thing I found on the high end of the quality (and price) scale was a small chapel, very prettily decked out and perfect for holding a small wedding, if you’re into that particular form of roleplay. The problem — if you’ll allow me to call it that — with the chapel was: It was unabashedly Christian. I’m not. I’m a Jew. 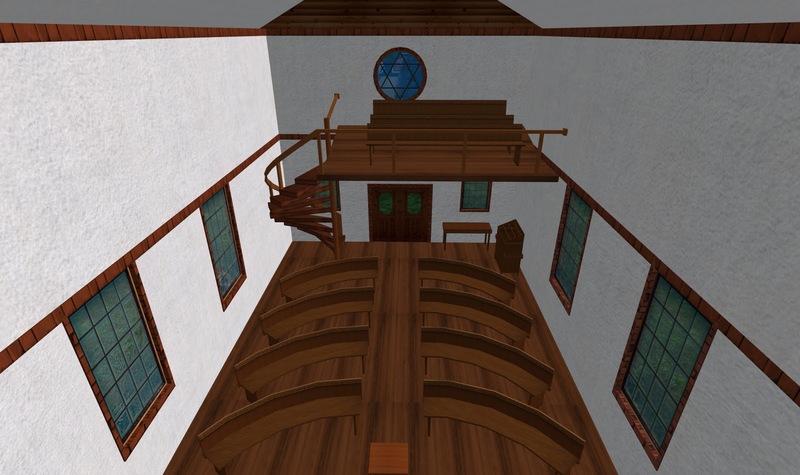 I’ve already noticed in SL that there is an overwhelming number of churches (as architecture, whether or not they’re used for worship), and very few synagogues, excepting the Second Life Synagogue and a couple of other builds in the same area. I resolved then and there that InWorldz would have at least one. You will find, if you spend a little time reading the forums about SL, frequent discussion about the scale of buildings and how avatar size and camera placement dictates that everything be bigger than it “should” be. I personally think there’s a bit too much tsuris about it, and my technique for keeping it close to real is to build it around me and test as I go. However, I did learn one important related lesson during this project: “bounding boxes” — that is, your avatar is bigger than you think. 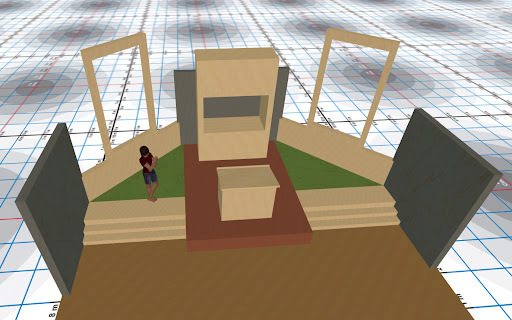 Put two pieces of furniture at a distance you judge by eye is adequate, and then try to get between them… You may find yourself spit out from the space like a watermelon seed because your invisible bounding box overlaps the prims you’re trying to stand between. There may not be physics in InWorldz yet, but in some cases, the Pauli Exclusion Principle does apply. The old schul I used as inspiration had a balcony, so mine had to have one as well. Mind you, I’m Reform, so that is emphatically not a “women’s balcony”. It’s overflow seating for the High Holidays and bar/bat mitzvahs, of course! By the way… if you’re engaging in a build which includes furniture, especially when that furniture has a specific formal arrangement, it’s a lot easier if you leave the walls for later. The hardest part was the roof. Of course, I couldn’t just make a rectangular floor plan with a simple two-leaf pitched roof, noooo…. I had to make the bimah end half of an irregular (but symmetrical) octagon. 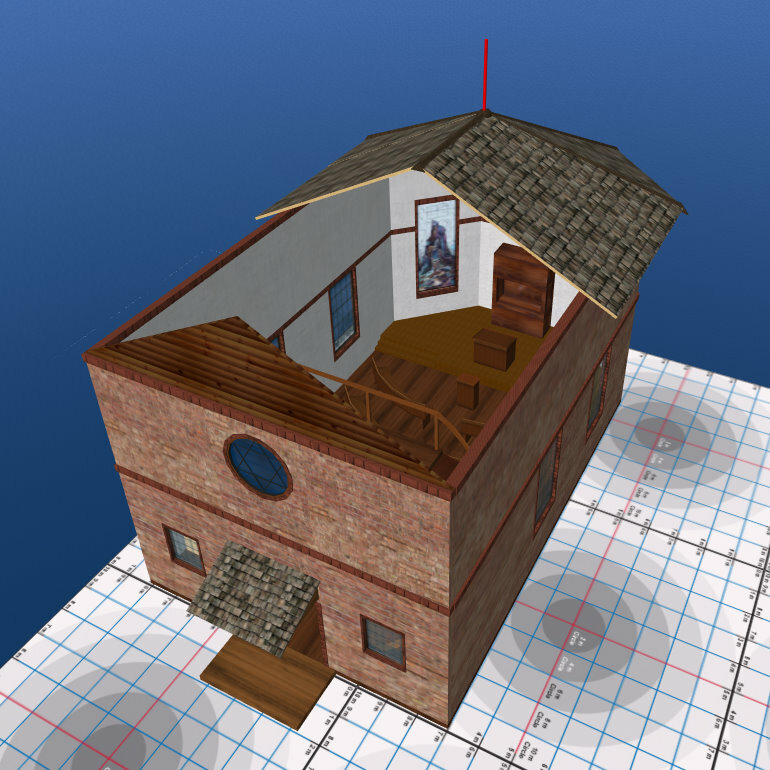 At first I tried to place the roof pieces in situ, and I fought and fought with each one, switching back and forth between World and Local coordinate axes, trying to get them aligned, to no avail and to much frustration. Finally, I had a flash of inspiration (while away from the computer, go figure…), that I may write a tutorial about soon — meanwhile, think “turntable” and maybe you’ll get it. Textures… ah, yes. A brick building was my inspiration, and among the textures in my file was that worn, pinkish brick wall. Once I applied it, it reminded me very strongly of tiny country towns in the part of Texas I now live in, with many of their main buildings more than 100 years old… so I went with it, and textured the trim as “native” sandstone, another common building material in these parts (so common, in fact, that you can’t walk far without seeing outcroppings poking above the grass). As for the furniture, I have one word: Madville. I love her work, and the inlaid wood series was just the thing. 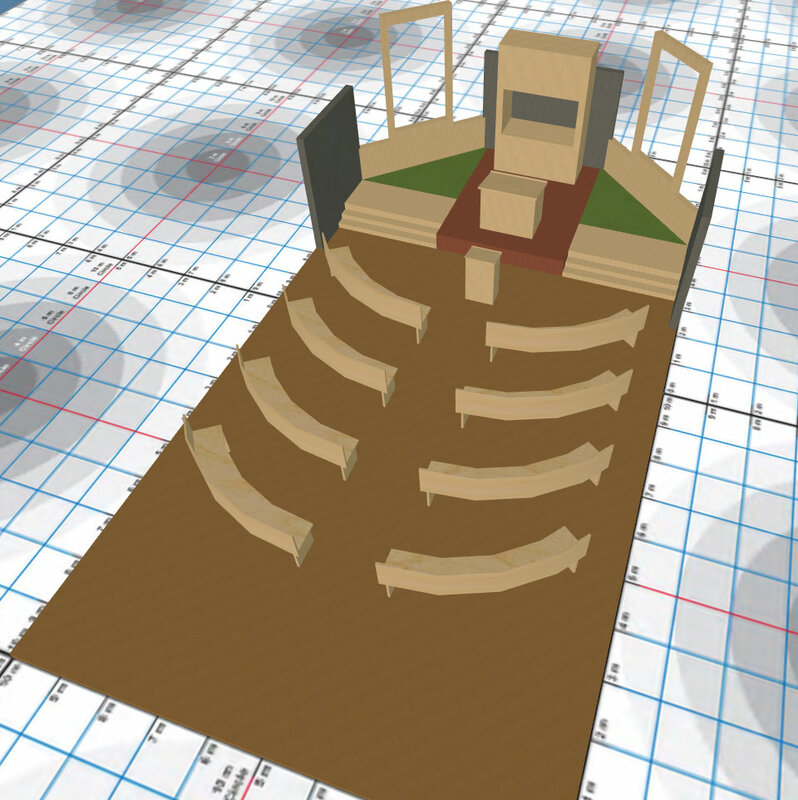 The other amenities I added are: a rack for tallitot (plural of tallis, the prayer shawl) with bins at the side for kipot (plural of kipah, which you may know by the Yiddish word yarmulke), and a table for prayer books. They’re both to the right of the door in that second photo. Oh, yes… one other essential item all synagogues must have: a ner tamid, or “eternal light” above the Ark. Subtle, simple, soft glow in a brass bowl, floating without suspension or support as only objects in virtual worlds can do. What this synagogue doesn’t have yet includes: Torah scrolls, books, better-defined stained glass, sit poses in the pews… a name… or a congregation. It’s complete enough that I moved it from the building platform up to the “sales floor” where Alisa and I display our work — and I threw a mental dart and chose a price for it, even though you can’t actually buy it yet. I don’t really want to sell the first copy of the synagogue. I want a minimum of ten Jewish avatars — “Grid Yids”, as my landsmann Crap Mariner calls them — to come to me and say “We’re a serious congregation.” I’ll say, “You got land?” and if the answer is yes, they get their synagogue. Free, with my blessings. “Zen and the Art of Making Stuff”: ludus and paideia, scratch-building every piece but according to basic rules. Yes, the hours melt away while you’re in The Building Zone. Look away from the screen at some point and find it’s past midnight. Look back at the screen and find pride in accomplishment, and that singular satisfaction only the self-taught, learn-by-doing folks know. So what if it is “the hard way”? That just makes it easier to remember. Does a synagogue have Buddha nature? Dusan, you did it again! We may not always agree (though there really only has been that one time; I posted my counterargument, and that was that), but one thing you never fail to do is: make me think. Enough of the personal messages disguised as introduction. ;) Dusan Writer posted “The Web, Drifting Into View” on his blog, based in turn on a piece by David Gelernter, “Time to Take the Internet Seriously”, published in Edge. One aspect of virtuality in general, and Second Life in particular, about which Dusan and I have never parted company is its culture (I’m tempted to capitalize the word — Culture — because it carries that much weight). My guess is that, if you were to ask each of us what we mean, we wouldn’t answer the same way… but that doesn’t mean that we don’t grok each other. So, what do I mean by culture? Commonality: shared experience; shared symbology and language; shared worldview; shared purpose; shared philosophies of what is “right behavior”, and why, and how to coax it from people… in the case of Second Life, I’ll even borrow from archaeology and include a shared “tool kit”. The operative word, obviously, is shared. Where else on the Web can you literally walk forward into a future that’s being crafted and created as we walk through it? And where else can you do so where other people share the space with you and may be altering it and changing it as we walk? Second Life is nowness without uniformity. Second Life is presence without the lumbering pressure of the algorithm, of homogeneity. Nowness is spiritual and ennobling, but only when our presence in time is our presence in our own truth. Another attitude Dusan and I share about the culture of Second Life is concern about its endangerment; how trends imposed upon it from outside — by Linden Lab itself, no less — threaten to dilute it, or wash it completely away. The more we side bar data and Web-ify it, the more we lose the value of the prim itself, its power as an information atom, and its ability to be assembled with other atoms to create richer meaning than a Wiki, a blog, or a MySpace page. If our nowness is presence in the uniformity of Facebook we’re only one cog in an algorithm, our domain of expression of our personal “now” is narrowed, confined, lessened. …socially connecting me to 200 people whose names I don’t know in Avatars United doesn’t mean I’ve connected with more people, it means that rather than me drifting into view people have collected me like a baseball card, I’m a Facebook profile now, when what I prefer is to slip into the back of a dance club and listen to the conversation wander and float. I believe the concerns are real, and they are certainly shared by (some) other Residents who write in the SLogosphere and forums. The question then arises, “What can be done to preserve and maintain this amorphous, evolving thing we call culture, without causing further harm by trying somehow to ‘enforce’ it with rigidity and the denial of its natural right to change?” The answer is elusive; the attempt to enumerate points imposes the very rigidity we are trying to avoid. Nevertheless, I don’t believe the task is as daunting as might be first thought, and there are two examples from the real world to back me up. The net will never become a mind, but can help us change our ways of thinking and change, for the better, the spirit of the age. This moment is also dangerous: virtual universities are good but virtual nations, for example, are not. Virtual nations — whose members can live anywhere, united by the Internet — threaten to shatter mankind like glass into razor-sharp fragments that draw blood. We know what virtual nations can be like: Al Qaeda is one of the first. Mr. Gelernter is mistaken. The first “virtual nation” to make an indelible mark on history was forcibly created in 70 C.E. It exists to this day, and is commonly called the Jewish Diaspora. Despite centuries of iniquities performed against them (which I hope needn’t be enumerated here), they survived — at times, they flourished — and even picked up a few additional members along the way, myself being one. The success of my first example in preserving their diverse, evolving culture in exile in the face of such adversity caused my second example to consult the first for advice. In 1990, His Holiness the Dalai Lama invited a cross-section of intellectual Diaspora Jewry to Dharamsala, India — the “capital” of Tibet-in-exile — precisely for that purpose. A great deal else was learned in the process; it is described as a personal experience by Rodger Kamenetz in his 1994 book The Jew in the Lotus (which I strongly recommend to Jews, Buddhists, and those “Juddhists” in between who have already discovered the striking similarities, as well as to curious goyim). A virtual “nation” or culture is not dangerous merely because it lacks a physical homeland. Nor is a culture founded in a virtual “homeland” irrevocably endangered by adversity thrust upon it. Resistance is not futile; you may refuse to assimilate.